NTT DATA MSE Corporation will make a breakout session and a demonstration at the AGL All Member Meeting (: AMM), which will be held from Oct. 17th, 2018 in Dresden, Germany, hosted by The Linux FoundationⓇ. We will actually demonstrate controlling permissions for SDL-enabled applications through operating SDL Policy Server and the changing of a behavior of SDL-enabled applications run on AGL UCB (Funky Flounder) after controlling them. Title "Realization of a Remote Privilege Management for SDL-enabled Applications with SDL Server "
Overview Hiroto Imamura will introduce our activities and achievements so far regarding SDL in NTT DATA MSE Corporation and Koichi Miyata will introduce the solution approaches of issues which were actually occurred through the activities on a remote privilege management for SDL-enabled applications. We have realized the Remote Privilege Management system for SDL-enabled applications which are installed to Smartphone through building SDL Policy server and implementing related functionalities onto AGL UCB (In-Vehicle Infotainment: IVI). This system allows us to control permissions of SDL-enabled applications regarding the setting of running or not on IVI, the setting of available data types, etc. 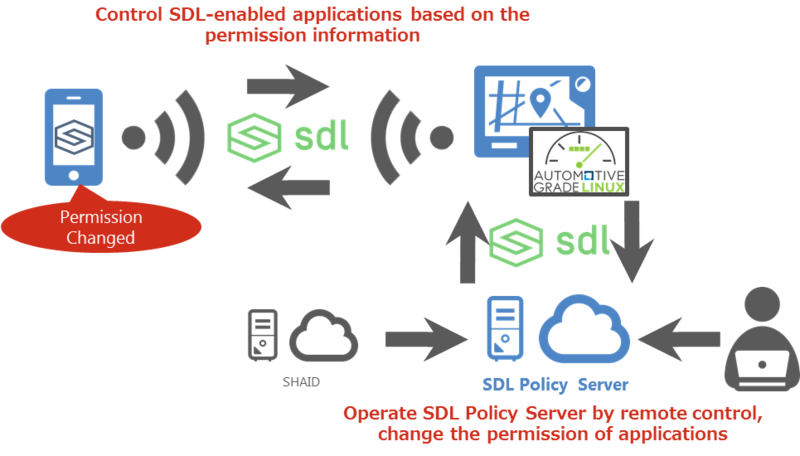 It will become to innovate SDL-enabled applications with SDL Policy server more safety.